They started slowly but the Wood River High School boys’ varsity soccer team came on like gangbusters in the second half of Saturday’s season-opening non-conference game against the Highland Rams at South Valley Sports Complex soccer field, Hailey. Junior forward Carlos Gonzalez, junior midfielder Danny Graves (penalty kick) and senior co-captain Sage Kelly tallied goals in the final 14 minutes as the Wolverines (1-0) posted a 3-0 victory over the visitors from Pocatello. The game was scoreless for the first 66 minutes. Wood River, last year’s State 4A tournament runner-up, picked up its attacking pace in the second half after the teams played evenly in the first 40 minutes, tying 5-5 in shots. The Hailey defense yielded only one shot on goal in the second half and ended up out-shooting the 5A Rams by a 10-6 count for the game. Senior co-captain Kyle Weller, Hailey’s goalkeeper, preserved the shutout with a handful of solid saves, including a stop on Jake Denney’s chip shot at 34 minutes and a save on Nico Lira’s testing chance at the 52-minute mark. Monjaras added about the attack, “We made an adjustment at half since we needed to play more direct and straight through the middle. We pushed Carlos to the top from the inside middle. He likes to drop back and then push forward, and he has the speed to do that. Before he scored the eventual game winner on a set play, Gonzalez created several scoring chances after half with Graves distributing well from midfield. Gonzalez had Wood River’s best chance at 53 minutes, followed by a Yuri McClure far-post opportunity that sailed wide. Sophomore co-captain Alex Ponce shot just high on a set-up from Kelly and Graves at 62 minutes. Gonzalez headed it over the net after a set-up from Scott, Kelly and Kyle Mungall. The flurry of Wood River chances resulted in four corner kicks after half, the Wolverines converting on the fourth. Graves pitched his corner kick into a crowd of players in the box. Scott had a chance with a header there, and it was Gonzalez gathering the loose ball and pounding it off the crossbar and in. Two minutes later, Gonzalez had a step on the attack—chasing a centering pass—when a Highland defender pushed him to the ground in the box. Graves made the penalty kick at 68 minutes for a 2-0 lead. Wood River’s final goal was a fine 80th-minute effort by Sage Kelly. Controlling the ball from midfield, Kelly tip-toed through four or five Ram defenders and found room to drill a 35-yard shot from the center of the field into the proper corner of the Highland net. Wood River is 9-0-4 in games played against Highland since 2007, but broke a streak of three straight ties with Saturday’s shutout. The Wolverines played Madison in Rexburg Tuesday and will travel to the Bonneville Bees in Idaho Falls Thursday, Aug. 28. 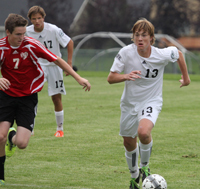 Madison opened its season with a 4-1 home win over Preston Saturday, while Bonneville won 2-0 over Minico (0-1-1) on the Rupert pitch. In season openers played in the Boise area, Canyon Ridge won 1-0 and 2-1 over Rocky Mountain and Timberline, while the Twin Falls Bruins fell 12-1 and 2-0 to Timberline and Rocky Mountain. And the Century boys from Pocatello prevailed 2-0 in Burley. First league game for Wood River is against Minico Thursday, Sept. 4, with the Community School (3-0) arriving in Hailey Sept. 6 for a non-conference match-up.